World record holder for oldest female solo sailor plans to sail unassisted around the world again. 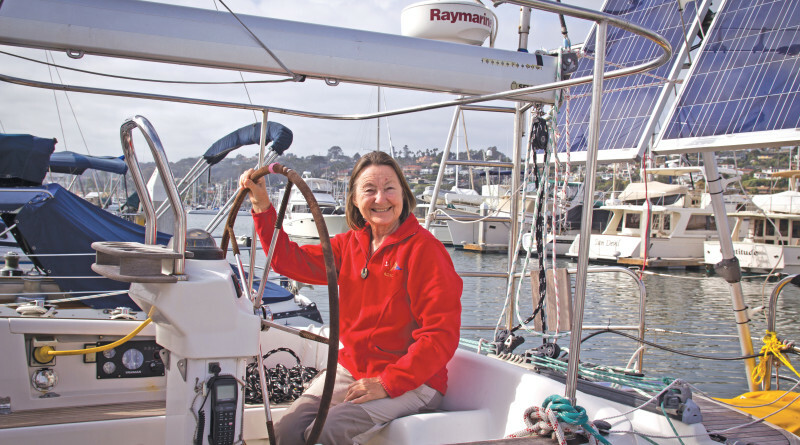 Jeanne Socrates achieved the Guinness World Record as the oldest women to sail solo, non-stop and single-handed around the world in 2013. With 2017 on the horizon, the sailor has a new resolution: set another world record as the oldest person ever to sail alone and unassisted around the world. The world record holder for oldest person to sail alone and unaided around the world is a man, Minoru Saito, 71, of Japan. Socrates was almost 71 when she completed her first solo sail around the world, though she wished she waited a bit longer to have completed her successful circumnavigation, therefore becoming the oldest person, man or woman, to sail the world a few years earlier. Socrates, now 74, set out to break the overall world record as she left Victoria, Canada in November. However, she was forced to stop in San Diego when her boat experienced equipment failures. The reason she has had to stop is to repair something on the boat she couldn’t fix. To sail solo nonstop unassisted means “no practical outside help and not making any landfall on the way. Stops at seas for repairs are allowed,” Socrates clarified. Socrates admits she may not have the strength of a man, but she just takes her time. 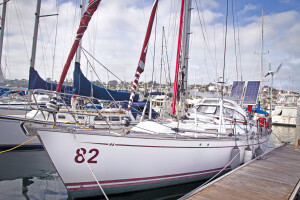 Her sailboat, Nereida, is a Najad 380, hull number 82. Nereida is 38 feet in length with a 12-foot beam and 6-foot, 7.5-inch draft. 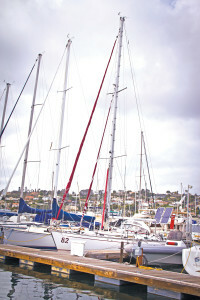 Socrates tries not to take the sails of her boat down during her circumnavigation unless she is to get in a big storm. The wind does the steering for her most of the time. She rarely ever has to be at the wheel. Out at sea, there is no one around, so she is able to lie down and sleep. She sets a stopwatch if she is worried. When there is a different noise or feeling in the boat, she wakes up and does a check. Socrates’ biggest frustration is having no wind. She is not allowed to use her boat’s engine for the world record title, so she relies totally on sail-power for sailing around the world. Her wind generator and solar panels help keep her batteries charged with a small diesel generator used for topping up when needed. Her favorite part of sailing is when the sailboat is cruising beautifully with the breeze, the sea is calm, the sun is shining and the albatross are nearby. She can then relax in the peacefulness of the ocean with only the birds to keep her company. The albatross stay with the boat for weeks on end. When asked if she gets lonely, she stated she really doesn’t. She uses a high frequency radio daily for sending and receiving emails and weather information. Her scariest experience was when her boat was knocked down west of Cape Horn on her first world record attempt. “When a big wave pushed the boat over,” Socrates said, “it was as if a ton of concrete hit the boat. The boom broke,” and there was other damage to the boat. Socrates was forced to stop on day 72 for repairs. Cape Horn was also one of her most amazing experiences. She successfully rounded Cape Horn two years after her boat was knocked down. There weren’t any humans around, though she was greeted by a pod of dolphins and albatross. What advice does Socrates give others considering sailing around the world? “Go for it but make sure your boat is well prepared,” Socrates answered. She also advised to expect the worst. She emphasized how important it is to make sure everything is strapped down, so when the boat capsizes – everything is okay. More about Socrates’ adventures at sea can be read on her online log at svnereida.com.